While looking for a cocktail to match the cuisine at Pammy’s in Cambridge, bar manager Rich Andreoli turned to Giuseppe Gonzalez’s Infante, a combination of tequila, orgeat, lime and orange blossom water. 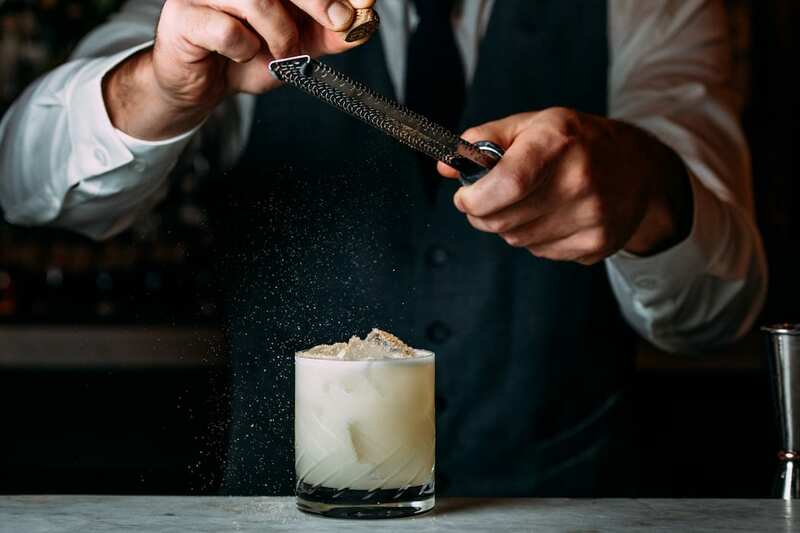 In this riff, Andreaoli tweaks the ratios and combines reposado tequila and lime with a housemade hazelnut orgeat (instead of almond-based orgeat). “The finishing touch is rose water to complement the floral tequila, and nutmeg to give it an added layer of complexity and spice,” he says. Add the first 3 ingredients to a shaker with ice, then shake to combine. Strain into an ice-filled glass. Spritz with rose water and garnish. Hazelnut Orgeat: Add ¼ qt. of hazelnuts to a blender and pulse until ground, about 10-20 seconds. Remove from the blender and set them aside. Pulse another ¼ qt. of hazelnuts until ground, then spread both batches of ground hazelnuts on a baking sheet and toast at 350 degrees F for 5 minutes. Once toasted, add the hazelnuts to a medium pot with ½ qt. of sugar and ½ qt. of water. Bring the mixture to a simmer, then remove from the heat. Place in a sealable container overnight to steep. The next day, strain the mixture through a cheese cloth-lined chinois. Add 10 drops of orange blossom water and ⅛ oz. of hazelnut oil. Store refrigerated for up to 2 weeks, fortifying with an ounce of Cognac if you’d like.